Here is something special. Something fun and beautiful ~ that will open hearts in celebration of the Earth and its abundance ~ a celebration of our global community and the nourishment of fruits & vegetables bursting forth from our gardens. Gardens around the world! I have painted 23 fruit & vegetable watercolor images (Octavia and Corinne Nicolina each painted one of the set, so it is complete at 25) to include in a box of small note cards to sell on amazon, across the international market. 'Produce Bliss Notes' (pun absolutely intended) are perfect for the international market because they are blank inside and depict the foods we all thrive on. How extraordinary! How meaningful for everyone. Displayed here is the cover of the box, which will contain 50 cards ~ 2 of each watercolor ~ ready to share with the whole world! These gorgeous, refreshing cards convey elegance and sincerity. In fact, they say it all: nourish your body, celebrate & nurture the Earth, communicate from the depths of your heart to everyone you appreciate. They can be attached to anything you can dream of ~ a bottle of wine or a bouquet of flowers ~ or any other present for teachers, colleagues, classmates, or beloved friends. You can even give a whole box to others as the best present ever ~ an invitation to celebrate and connect. Share the bliss with your entire community. We hope you'll be inspired to give to this Earth loving, enlightening pursuit! And then come stay at our house in Sicilia ~ set in 3 acres of the Monte San Calogero nature reserve in an olive, lemon, pear, almond, and pomegranate grove above the sea. 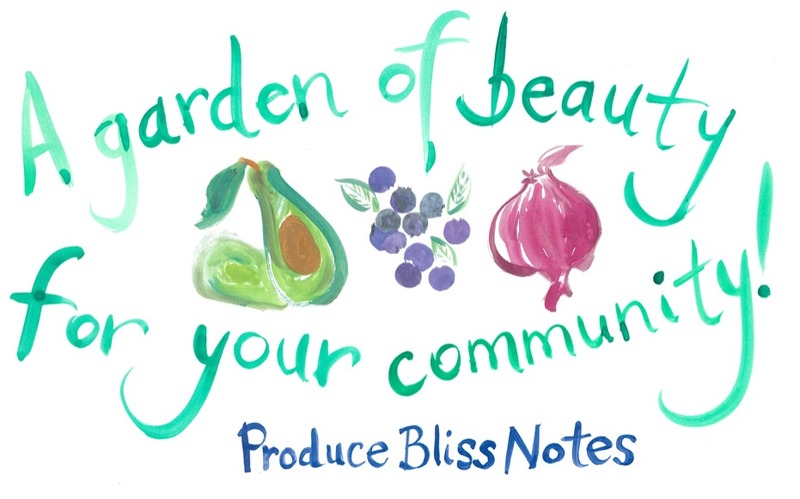 This paradise (as well as the need for a perfect accompaniment to gifts all year long) was the impetus for the painting of Produce Bliss Notes ~ truly a garden of beauty for our shared community. We are all connected, and so we should embrace that with notes that convey bliss, beauty, and abundance. Thank you ~ grazie mille!